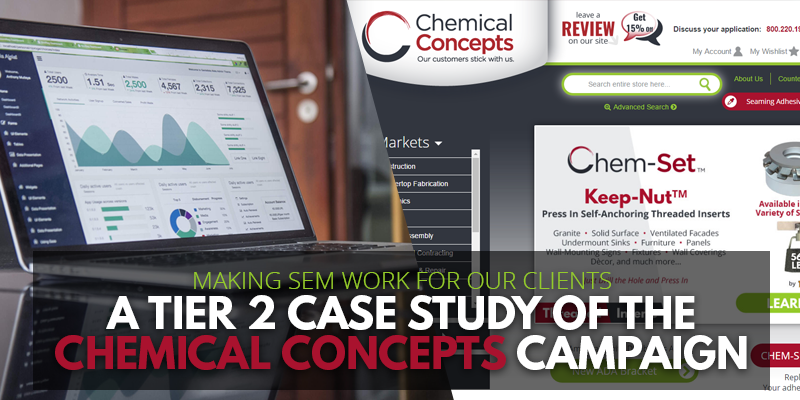 Making SEM Work For Our Clients - A Tier 2 Case Study of the Chemical Concepts Campaign | Sharp Innovations Blog | Sharp Innovations, Inc. If you’ve ever sat down for one of our free website design or internet marketing consultations, you already know that we do things a bit differently here at Sharp Innovations. We want to understand your business inside and out, and we look to identify your goals, the target audience, potential hardships and more before we dive into your new website or internet marketing project. In an effort to cater to the ever-changing digital landscape, we previously launched a three-tiered approach to our search engine optimization (SEO) efforts. While most clients fit into the Tier 1 program, some look for a more proactive approach that focuses on conversions, Return on Investment (ROI), Key Performance Indicators (KPI), accelerated content and more. This is why we launched our Tier 2 and Tier 3 SEO programs. There were 19% more user sessions in 2016-2017 when compared to 2015-2016. Organic referrals were a driving force in that growth, as Chemical Concepts saw 28% more organic referrals. You may be thinking, ‘The extra traffic and referrals are great, but are they converting?’ The answer is a resounding yes – to the tune of a 45% increase in goal conversions (those visitors filling out the contact form or placing an order)! This increase in goal conversions also accounted for a 35% increase in online invoiced sales. We’re thrilled with these results and would love to replicate them for your business. To get started on custom tailoring your own Tier 2 SEO program, give us a call at 717-290-6760, send us an email at sales@sharpinnovations.com, or fill out our brief contact form. We look forward to working with you! Posted in Internet Marketing, PPC, SEO, Social Media, Websites and tagged blogging, email marketing, search engine marketing, search engine optimization, sem results, seo results, social media marketing, video content on February 27, 2017 by Rodney Hoover .